I don't want to update the phone or apps, automatic.. but when ever i turn it off, later ti turns back on and starts updating, when ever i connect to an Wifi, so now i never use Wifi because of that. Under settings- Apps - Software update - Three dots, switch off "automatic updating"..
- I cant do this before bed, and in the morning its on "autmatic updating only wifi", puts it back to never.. When i come home from work an it connect to my wifi it begins to update.. it has swicth back to "automatic updaring on wifi"
The same i with the build in apps, Theme, What's new.. Same issue is when rebooted, i need to swicth every thing off once again.. It seems to be an Android problem. I have mine (in Oreo) set to never, but it still updates. And I don't have "Enable auto update" checked on any of them. It just seems to pick a few every day and update them. There's a long list of "you shouldn't have done this" things going from me to Google. Also, do you have the Developer Options enabled? If so, make sure that 'Automatic System Updates' is switched off. I think this option is enabled by default after Nougat. Rukbat & Javier P => Thanks for replyen..
Nice to know it's not just my phone, but more general issue..
Javier => Yep, it's in develeoper Options enabled, and Automatic System Updates is off. It's false to belive anything, when the system constant overrules my settings.. I have auto updates off for apps and system and never had that problem. The only apps that auto update in the background are Google Play Services, Instant apps and the Play Store. javier P => Yep, thats set to Off.. This Morning i Put it once again on "Off", now waiting to see when is on "Wifi only" again. I'm not that savvy with nougat, but the default setting was "auto update over wi-fi only" in the play store... so I just set it to never auto update. Now I just get a notification of available updates, but nothing updates unless I go into the play store and choose updates to install. It even says auto updates are turned off at the top of the screen. Androids only customizable to a small percentage of Android fans... to the rest of us it's just an overly complicated pain in the azz. Although I'm pretty sure Google does it on purpose so we'll leave the settings stock and they can absorb every single bit of our personal data. Sob's. I'm pretty sure my next phones going to be a flip phone that seems to be coming back into style... I wonder why? I am extremely frustrated. Samsung Galaxy S9+, auto update is turned off. 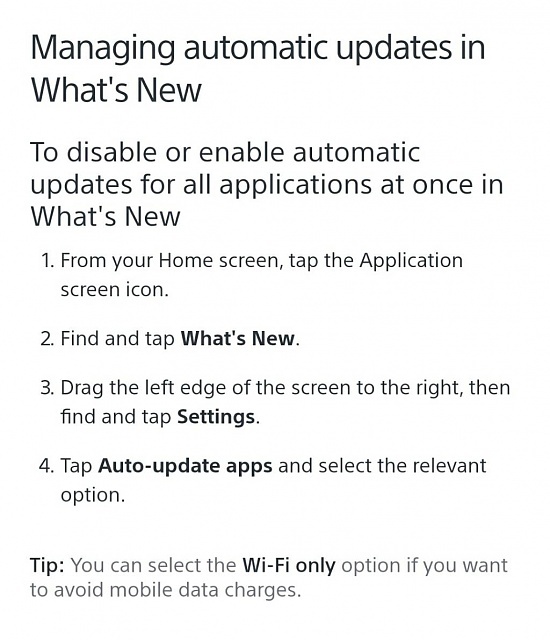 There is no option in each app to turn auto updates 'off' just options to turn them 'on'. These stupid updates update on WiFi and on cell data, which it shouldn't. I am now getting an insane number of ads gumming up my phone. If I back up the updated apps to a prior version, to try and resolve the ad issue, the phone waits a few minutes and then re-updates the app. I can't find the source of the ads because the phone updates whatever it wants, whenever it wants. Auto update is off in Galaxy apps, too. I have it turned off everywhere it can be. And it doesn't say "I'm updating" it says "I just updated", so I can't click anything to stop it! I'm losing my mind with this piece of...! They really need to fix this. I can't fix the ads problem because of the update problem!!! I just went into my setting and completely disabled Google Play Store. Hopefully this will be a temporary solution so I can find the ad problem. Can popups be blocked during do not disturb time?